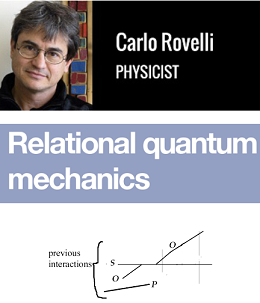 Carlo Rovelli's overall position is classed as “relational quantum mechanics” (RQM). This is an “interpretation” of quantum mechanics in which a quantum system is seen as being “observer dependent”. In terms specifically of the “relational” in “relational quantum mechanics”, this means that there's a relation between an observer and a quantum system. The importance of relations is broader than one may initially think. Rovelli himself ties it to relativity theory. Take the velocity of any object. The notion of the velocity of object O as it is “in itself” is deemed to be meaningless. The velocity of object 0 is actually measured relative to - or in relation to - other objects. Now take two events which are deemed to occur at the same point in time; even though they do so at vastly different places from one another. In the case of special relativity, both events must be measured relative to (or in relation to) something else. In addition, when it comes to general relativity, objects in space and time (or in spacetime) need to be seen in relation to - or relative to - the gravitational fields in which they're embedded (or to something else which is “dynamical”). However, Rovelli broadens out his relationism even more when he moves from quantum mechanics and Einsteinian relativity to - of all things! - what he calls “man”. We can say, then, that Rovelli doesn't believe that man has a substance (or an “internal structure”) - and he certainly doesn't have what philosophers call an essence. Instead, man is “nothing more” than a network of relations. In this case, Rovelli's relationism moves from the quantum scale to the “classical scale” - and there's nothing more classical than man. However, here we can argue that there must be something (or some thing) which has these relations. So is it good enough to argue that whatever this thing is, it is itself made up entirely of relations? Having just mentioned ontic structuralism realism, there's nothing in Rovelli's account that immediately clashes with ontic structural realism. It seems to be a simple difference of stress. Indeed Rovelli himself also talks about relations. In any case, things seem to be eliminated from the scene in Rovelli's scheme. We can now move to Nathaniel David Mermin (a solid-state physicist) to get a more explicit position on such ostensible thing-eliminitivism. In his “Ithica interpreation” we have what he calls "correlations without correlata"; instead of ontic structural realism's “relations without relata” . "correlations have physical reality; that which they correlate does not". So whereas James Ladyman and Don Ross (two ontic structural realists) have (sometimes) said that things aren't actually eliminated from their ontic structural realism (perhaps simply because things are themselves structures), Mermin is far more explicit about his position. Much of this ties in with Heisenberg's well known “uncertainty principle”. In the updated language of Carlos Rovelli's relationism, it can be said that Heisenberg argued that it's only when the electron is “interacting” with another system that its position can be detected. When it's not interacting, the electron is “spread out” over many different positions. That is, the electron is in a “quantum superposition” of various different positions. What's more, this is a relationism which not only includes interactions with other systems: it also includes interactions with human observers. That is, the position of the electron can be determined by an observer; a “quantum reference system”; or by an experimental apparatus/experiment. So this is a set of relations “all the way down” - from particles to systems to human observers to experimental setups. More technically, we have an “observer system” O (which can be seen as an epistemic system) that interacts with a quantum system S (which can be seen as an ontological system). In more technical detail, we can have a system which is in a superposition of two or more states. We can “collapse” this system to achieve an “eigenstate” which is (at least to some degree) determinately circumscribed. Thus if we have two or more “interpretations” of system (or state) S, then observers must have been brought into the equation. And that means that there are additional relations (or "interactions”) to consider. This also means (or can mean) that we also need a second observer (O') to observe the observer-system (O); which, in turn, observes the quantum system S. This multiplies relations indefinitely. Indeed don't we have a possible infinite regress on our hands? This is a concrete example of the problem of “Wigner's friend”. That is, if I collapse the wavefunction for an electron, then my friend has to observe me collapsing the electron's wavefunction. He also need to collapse the wavefunction which is myself collapsing the electron's wavefunction. Then a friend of my friend will need to observe my friend to collapse the wavefunction which is my friend; who, in turn, is also collapsing the wavefunction which is myself. And so on. Carlos Rovelli also tackles the electron. If the electron does literally vanish, then how can it then reappear? How how can something that ceases to be, then “reappear”? Surely if something vanishes (or ceases to be), then something entirely new (or something else) must (re?)appear. Of course we're talking about quantum states/systems here so my questions may well be naïve or uninformed. Firstly, what exactly is meant by Rovelli's word “vanish”? What we may have is various fields and forces which are “strong” or “excited” (as in “excitations of fields”) at one spacetime point; which become weak at other spacetime points; and then (due to Rovelli's “interactions”) appear (or become stronger) at another spacetime point. In terms of Rovelli's own detail. If this ostensible disappearance of an electron is accounted for by the “mysterious quantum leaps which appeared to underlie the structure of the atomic spectra”, then, between x and y (the “quantum leap”), there are still fields and forces. (Elsewhere, Rovelli says that “an electron is a combination of leaps from one interaction to another”.) However, the strength of the excitations of the fields and forces aren't enough (i.e., between x and y) to constitute an electron. However, when this something gets to y, the excitations of the fields and forces are indeed strong enough to constitute an electron. It can now be said that the electron at spacetime point x shouldn't really be seen as “the same as” (or identical to) the electron at spacetime point y. Indeed why see it as the same electron at all? Technically, this can be partly explained by reference to something Albert Einstein described way back in 1916. An electron can be in an “excited” state of fields and forces. That partly means that the electron has extra energy to that which it had before. Indeed it may not be correct to see it as the same electron before it had that excited state of extra energy. One other consequence of this excited electron is that if a photon with a particular wavelength “passes” the electron, then that photon can make the electron leap/fall/jump into a lower energy state. That, in turn, will result in another photon being released with the same wavelength as the first photon. So then we would have two photons. In terms of the theme of this piece, we can argue that the electron doesn't exist at all between the the low-energy state and the high-energy state (i.e., there's no electron – therefore no electron fall - between low-energy x and high-energy y). Indeed without any kind of excitation (therefore any kind of energy), the electron doesn't exist at all. That is, there is no electron between x and y. Despite all that, Rovelli himself doesn't speak in terms of excitations of fields and forces: he talks, instead, in terms of “interactions”. That is, the electron reappears when it “interacts” with “something else”. However, this may be to say the same thing in a different way. That is, interactions in a quantum state (or system) are the same thing as excitations of fields and forces within a quantum state (or system). In other words, the interactions cause the excitations of fields and forces within a state/system. Thus Rovelli believes that the electron is literally “nowhere” between the earlier x and later y. In that case, it makes no sense to say that the “electron is nowhere” because it's (roughly) equivalent to saying, “My long-dead cat is nowhere.” Having said that, the conclusion that there is an electron at spacetime point x and another electron at spacetime point y (though no electron between spacetime points x and y), does seem to contradict certain positions in quantum mechanics. I would express it this way. There is no electron between the interactions. If an electron exists at spacetime point x due to interactions, then when such interactions cease, the electron itself ceases to exist. And when we have another interaction at spacetime point y, then there's an entirely new electron. In other words, in the spatiotemporal region between spacetime point x and y, there is literally no electron. Of course there must be something between x and y; though, still, there's no electron. To make this talk of systems simpler, it's worth noting (again) that human observers are also classed as systems. What's more, relationism actually appears to introduce an element of relativism in that when it comes to an electron, it only has a “meaning” relative to an observer or a system. Thus, if you are that system, then whatever it is you observe, then it only exists in that manner (or at all) for you. In Rovelli's words, it only exists in that manner because you've “interacted” with it. Systems (including observer-systems) measure/observe systems because a systems can't measure/observe themselves. Indeed even in the “classical world” it can be said that the world doesn't tell us about itself. That is, the world doesn't have its own favoured description. That's why systems are required at both the quantum and classical levels. In anti-realist or epistemological terms, only systems can know the world. That is, physical properties only become absolute when they they interact. Or, instead, we can drop the notion of absoluteness altogether and say (from an anti-realist perspective) that we can only know physical things when they interact. And by “interact” (in this case) I mean that human observers (or observer-systems) are also doing the interacting. This, surely, is a new addition to the anti-realist's armoury. All this can be expressed technically in the following manner. We have what's called an “abstract vector space”. We make a measurement of it to get q. In terms of relationism, this is the probability that the system S being measured can affect the system S' (or an observer-system) in a joint interaction. Because of the importance of different interactions with S, the wavefunction Ψ must take into account different observer-systems and therefore different outcomes. All outcomes are probabilistic. And all observer-system interactions “collapse the wave function”. Is RQM an Anti-Realist Position? Perhaps we can display a philosophical bias here and say that relational quantum mechanics is basically about epistemology trumping ontology. Perhaps it's about what we can know and what we can't know. Thus, according to Rovelli, “relations  ground the notion of 'thing'”. Epistemically, we can know these “relations”: we can't also know “things”. And, because of that, Rovelli also says that “[t]he world of quantum mechanics is not a world of objects: it's a world of events”. It can now of course be said that it must be things (or something) which interact. Yes; though, again, can we know them? So if we're dealing with what Rovelli calls “occurrences”, then, as a consequence, we're also dealing with relations. That is, if anything, occurrences or interactions can only be occurrences or interactions between a system and another system. It can be argued that we know nothing of things. We only know about the relations between a system and another system. So things aren't said not to exist: it's simply a case of things actually being (at least in some sense) Kantian noumena. Here again we have the mereological reality of an “object” being constituted by “its” processes or events. If you take away the events, then you also take away the object. The object, then, is nothing more than the processes/events which constitute it - even if those processes/events are “monotonous”. So whereas Goodman expresses himself in philosophical terms by talking about an “object”, Rovelli elaborates by saying that an object (such as a stone or an electron) is actually “a vibration of quanta that maintains its structure for a while”. As just hinted at, perhaps that's because we're talking about the interpretations of quantum mechanics here. And in terms of experiments, predictions and technology, this means that these interpretations – ultimately – don't make that much of a difference. This also means that it may not be possible to conclusively establish which interpretation is true or false. Indeed perhaps many rival interpretations are true at one at the same time. Or perhaps no interpretation is true. It may even be the case that truth shouldn't really come into this because truth may require a metaphysically-realist stance. Yet, in the domain of quantum mechanics (perhaps elsewhere too), ontological realism may be impossible. *) See my 'Lee Smolin's Relationist (Meta)Physics'.